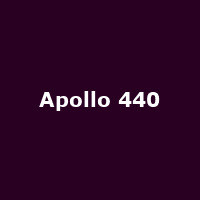 Apollo 440 are an English band from Liverpool, formed in 1990 formed in Liverpool in 1990 by founder members and brothers Trevor and Howard Gray, plus Noko and former menber James Gardner. As well as releasing albums in their own right, the band have worked with and remixed a diverse ranges of artists, from U2 to Hotel and Jean Michel Jarre. They released their debut album, "Millennium Fever" in 1995, followed by "Electro Glide in Blue" (1997), "Gettin' High on Your Own Supply" (1999), "Dude Descending a Staircase" (2003) and 2011's: "The Future's What It Used to Be".